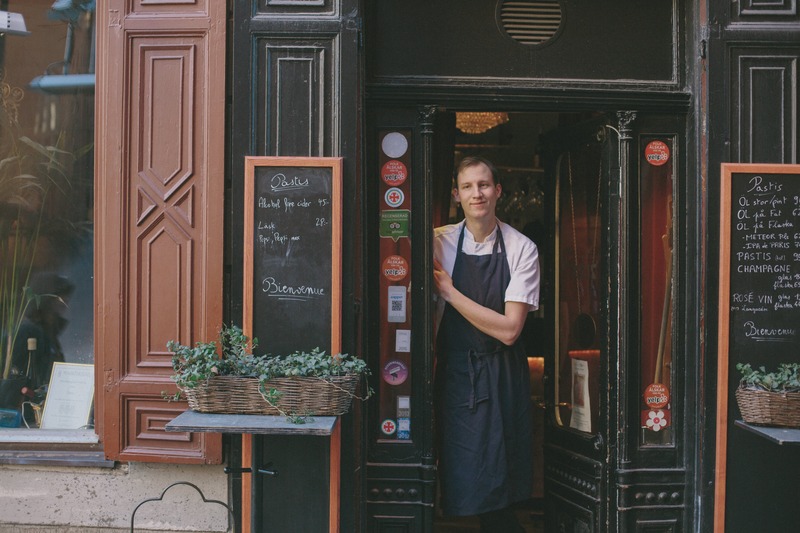 With only 24 seats, reservations are a must to visit Bistro Pastis in Gamla Stan. Tucked away in Gamla Stan, the old town of Stockholm, you’ll find Johan Hammarström serving locals and parliamentary dignitaries alike - on the same island as the iconic German church and Stockholm palace. Gamla Stan is one of the most famous vistas in Stockholm, with the iconic square reprinted in various forms on tea towels, mugs and t-shirts - so it might be surprising that Bistro Pastis breaks from the norm and serves a wonderful French repertoire, rather than the traditional Swedish fare of its competitors next door. We sat down for a coffee with Johan and to try some plates of French-Norwegian fusion food. In between, we discovered his thoughts and philosophy on cooking. Can you tell us a little more about yourself and your restaurant? Well - my name is Johan Hammarström and I work at Bistro Pastis in Gamla Stan, Stockholm. Bistro Pastis is small and intimate. It is probably Stockholm’s smallest chambre séparée. You need to book, the restaurant fills up super easy and we hate to turn people away. I love where we’re located, right in the centre of Stockholm old town, the royal palace is only one block away. You come to work and you can feel the history. We serve all sorts. Members of Swedish parliament. Local punters. And you guys! About that. Thanks for your fusion recipes - they were delicious. Great. Cooking fusion style is so fun and exciting. You can make every single combination of flavours out there - new sensations and entirely invented dishes which nobody has ever had the chance to do before. It was fun using Snøfrisk®. It is a great quality product, with a nice feel to it and a the pleasant goat’s milk taste. It works well because it is distinct but not too rich either, and will not dominate or take-over the other flavours of the dish. French cuisine is so varied - from rustic to Michelin starred. Which do you prefer? French food is amazing. Of course I would say that. But the deep passion, such heritage and history - the major influence it has had on pretty much every cuisine on the planet. Marvellous. This might be a surprise, but as much as I love the hearty and rustic family-style home cooking, I do adore the aesthetic of the 1970s and 80’s French Michelin-starred restaurants. Uptight, elegant and the ultimate exercise in refinement. There is something to be admired there. But both styles taste fantastic. Naturally. I’m biased. Your menu is very different to all the other Swedish restaurants in Gamla Stan. How do you stay inspired? My menu is - of course - French to the core. Very un-Swedish! I often find myself watching old cooking shows and feeling inspired. And whilst I love good food, bad food is an equal motivator... if I see or eat something terrible, I get the urge to make it myself and do it better - to do it justice! And of course, I scroll through the Instagram accounts of all the talented chefs and cooks in Sweden - there are many! Both ‘known’ and up and coming, I follow them all. I’m always looking for new inspiration! Being a chef sounds like hard work? It is, but it is also the best job in the world. Nothing compares to the ambiance and the sound of a full restaurant. The smell from the the kitchen, the whirring of the printer with new orders, the clatter of finished plates slamming into the steel benches - it has an atmosphere like nothing else on the planet. And the bond you build with your colleagues working as a team can be truly magical. I love it. It is all about using good quality products with classic and modern cooking techniques to create the best flavour. Yes, it is the same old answer everyone gives but that is simply it. You’ll learn how to spot good quality produce by thinking like a chef. Look at it closely, feel it, taste a piece, take a big sniff. Also, a higher price can be a tell. I think also, don’t be afraid to make mistakes and enjoy yourself. Especially with fusion cooking. Don’t cook it just for the sake of it or because you feel like you have to. Don’t force it, some combinations will just never mesh well together. Be brave, leave the recipe book on the shelf and have fun with it. A bad dish is just a lesson for a future good dish. Great advice Johan. Make a reservation at Bistro Pastis in Stockholm, or try cooking his Snøfrisk® Fusion recipes here.